Out the box the Frsky R9MM antennas and most the other receiver antennas are really poor. There are lots of arguments over the antennas lengths but really fractions of a mm or a mm or so aren't going to half your range the antenna being fractions out will only reduce the maximum potential range. So with that said what's all the problems with them then ? Well the main problem is the way the user is installing them, totally incorrectly on the likes of a mini quad rendering the antenna pretty useless against the carbon. Others are putting them alongside signal blocking lipos etc. The other main issue with them is the position they are in when they are installed, the antennas are Dipoles so should be installed at 90 degrees to the feed point and inline with each other. They do not come like that though so this is where a lot of issues are coming about. First what do we need ? Cut the antenna tubes to length so they cover both elements and a portion of the feed wire. Then desolder the black wire to enable you to push the antenna tube over the whole antenna to the rear. 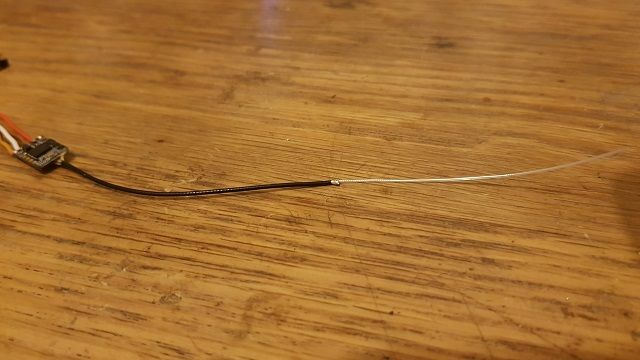 Solder the black wire back on again as close to the split point as possible. Put the other two tubes over the elements and cover the inner ends in UHU Por and leave to go tacky. Then apply UHU Por to the printed T parts and again leave to go tacky. Once tacky lay the tubes inside and bring together the two T parts, the Por will now hold the antenna together. 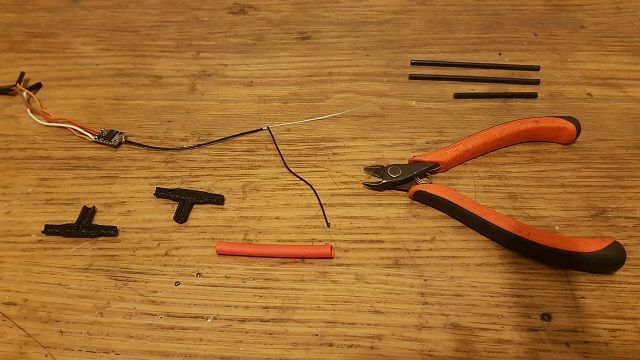 Cut the heat shrink to the required length and slip over the antenna tubes, heat and they will hold the antenna together while the glue dries and trim the antenna off nicely. I uncoupled the UFL connector on mine and slipped a piece over the feen end to neaten that bit up as well. Does Trappy know you have stolen his "Immortal Tee" antenna..? That 868mhz Moxon for the TX should be epic with this. The lengths should be 77mm I had forgot to put in the post also. The interesting thing is, on that recent UAV Futures Video, he was using tubular sleeved Dipoles on his diversity receiver. 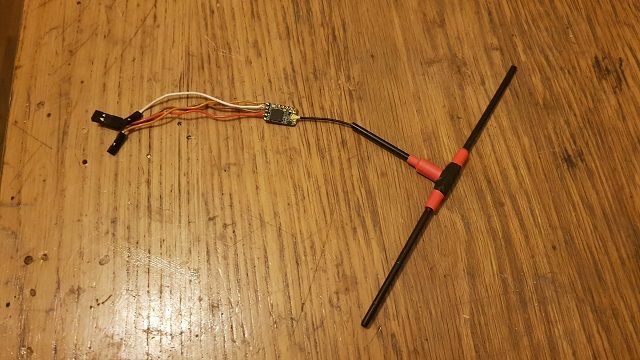 A 90 degree push connector and this arrangement has to be a good idea from an install point of view on a Fixed Wing, not so clever on a Mini Quad for sure. 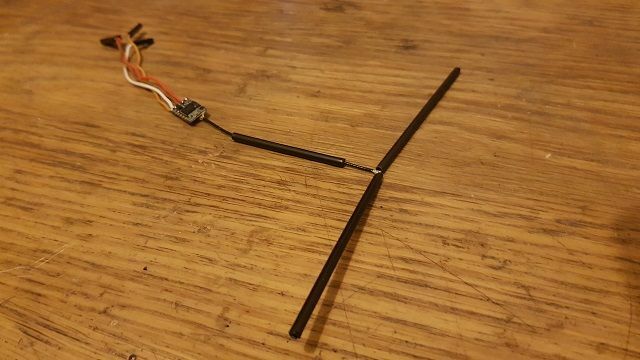 So, how important is the 90 degree feed wire in the case of the "Tee Antenna"...? In an ideal world it wants to be 90 degrees at the feed point, if it runs along side the element it will of course be blocking some of the signal so its not ideal at all. 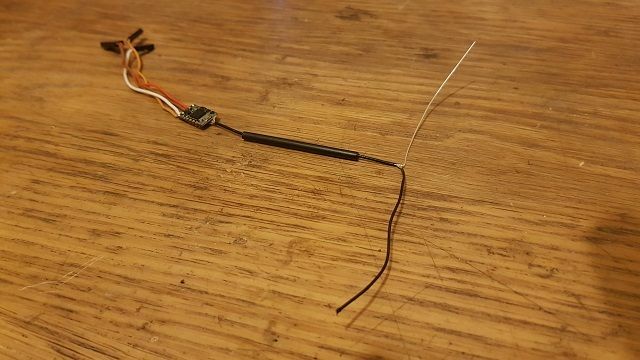 The best approach for quads is a Sleeved Dipole which is great for mounting but does not incur any of the losses from the coax being in the way as instead it is inside the sleeve. Ah, yes of course the sleeve surrounds the feed cable...never thought of it like that, I thought it was just the active part which did the receiving..
Be interesting to make one and try it, just need some 2mm brass tubing i think...? You can buy them from TBS already made, and very well made they are too. You do though get them in SMA format only so on a receiver you would need a U.F.L to SMA adaptor so it could mount to the frame. I have placed an order for a few a few days back. Yeah, I was thinking for the receiver though, those are Transmitter Dipoles...? In the video, he clearly has sleeved Dipoles on his receiver.. There is no operational difference between transmitter antennas and receiver, same thing, they can be used on either end. However the transmitters are SMA and Receivers not so you need the SMA to IPEX patch cable to use them.